You are currently browsing the category archive for the ‘Tree-Scapes’ category. Love, romance, that special someone. There’s still time to find that perfect hand crafted gift! 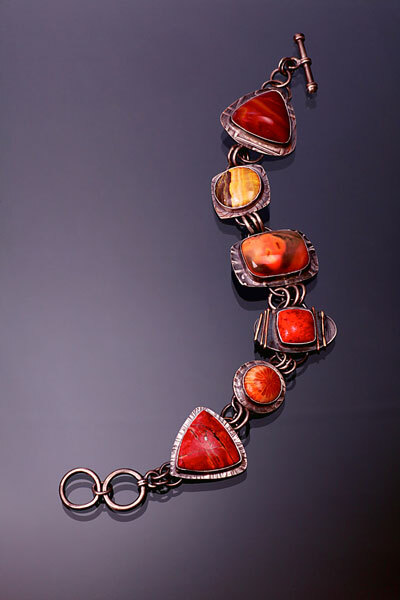 All of these latest works will be available at my Valentine’s Day Trunk show, this Saturday, February 13, 2016 at the wonderfully enchanted Santa Fe Trail Jewelry in Historic downtown Monument, CO. I have been preparing for this upcoming trunk show. One of the things I like to do for these special events is have an offering of what I am currently developing. 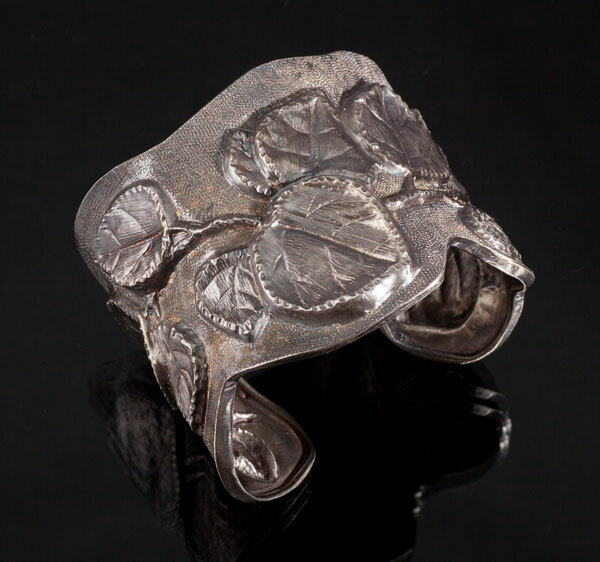 Not only does this give my clients and Santa Fe Trail Jewelry aficionados the opportunity to have first choice, but it also gives me immediate feedback of people’s responses to the new directions I take with my work. 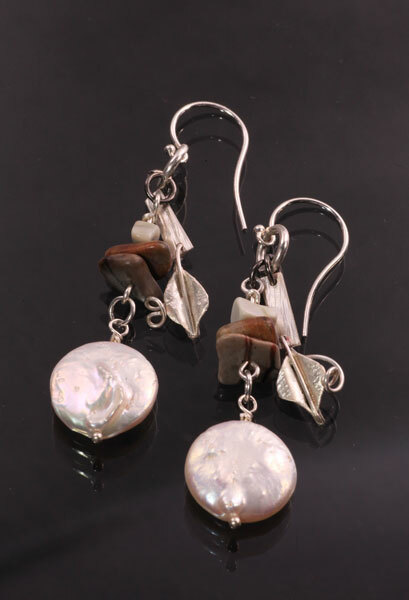 Asymmetrical earrings are one way I feel people can really express their individuality with distinctive, one of a kind art jewelry. Treescapes are certainly a favorite. This series continues to evolve as I look for new inspiration and ways to make them even more unique. 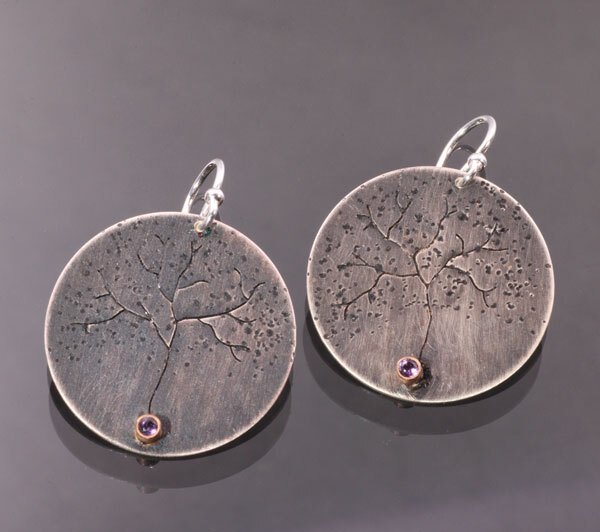 These earrings are inspired by a little Bonsai tree that sits on my bench. I’m having great fun adding gemstones, like the faceted peridots, as the base of the tree. 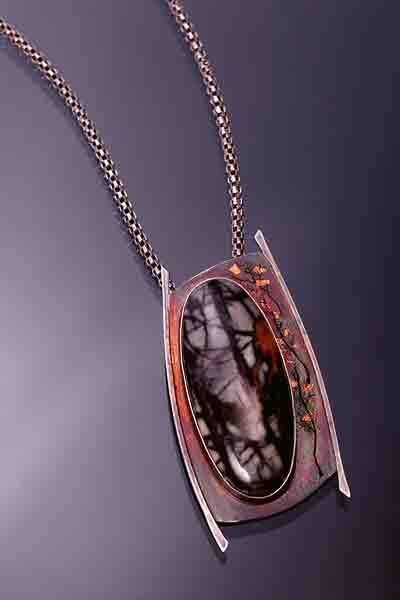 This style of Treescape pendant is growing in popularity too. Here we have a richly colored Variscite stone as the focal point with my Bonsai tree accent. There are many more that will be available this Saturday. If you don’t live in the area and see something that calls to you, send me an email for details. Until next time, I continue to aspire to be more as an artist and a person. Happy Valentine’s Day! Part of “Shop Manitou Night” on November 20. Please join me for the opening reception next Friday November 20th, from 5-8pm. The Commonwheel Artists Holiday Market is a favorite tradition in our area. I’m happy to be one of the Colorado artists participating in the event. This truly is a great opportunity to shop for and give the gift of fine art. 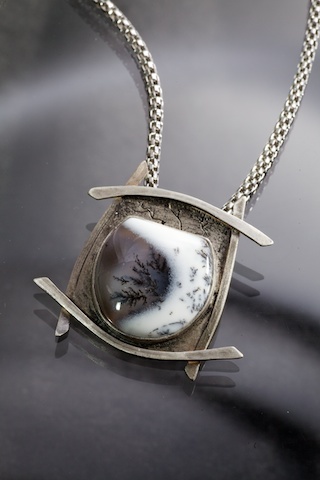 I have created a new collection of works, Treescapes and other art jewelry to express your individuality and find that perfect gift. I have been fortunate that the start of 2014 has been relatively quiet and allowed me the precious gift of time to prepare for the busy months that are coming. I am so very grateful that I have had this time to explore new things and improve on existing techniques. The pendant at the top of this post represents one of the staples of my Treescape series. 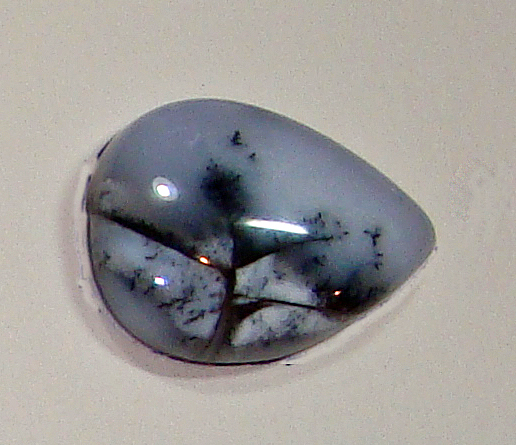 A stone variation, yes, with a lovely Chinese Writing Stone. To me they symbolize simplicity and elegance. Garnet is my birthstone. 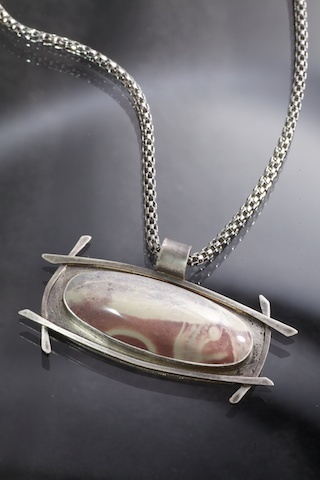 The deep red in this faceted garnet seemed like just the right contrast for the Chinese Writing Stone. 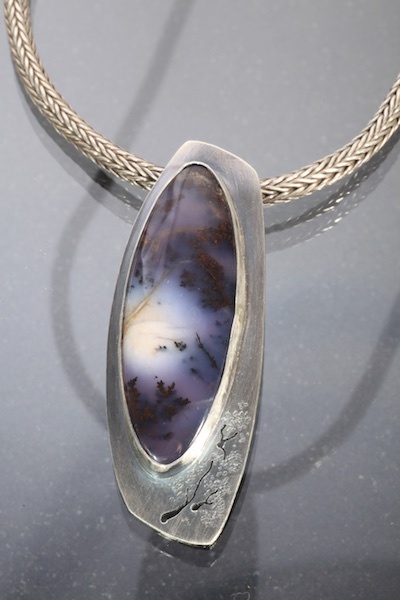 The pendant has a sense of tranquility to it, so that is why I call it Serenity. Another of my favorites is Picasso Stones. I finally understand why I love these stones so much. It is because they look like tree roots and as most of you know, I LOVE trees. This one has a touch of gold. A great friend, Jerry McClure (who creates the most spectacular knives), suggested that I add Keum Boo gold to my Treescapes as leaf accents. Well, I definitely like this look so you can expect to see more gold in my work. I am exploring textures. I find that just the right amount adds so much interest, especially when patina enhances them. 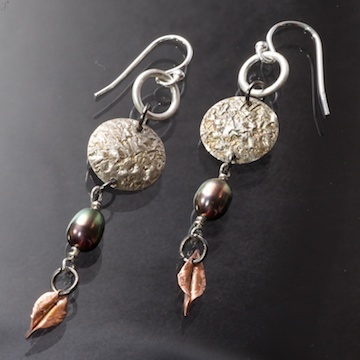 These earrings are comprised of Mookite and textured sterling silver with a dark patina. I’m very happy with this look. Expect to see more of this in my future works. Ah, the return of the stone bracelet! I so enjoy making these. Now I must admit that wasn’t always the case and I made more than my share of mistakes with my first couple of these. However, I am persistent and I have learned from my efforts. Now I’m changing things up a bit with textures, adding some gold accents and trying to find the right color combinations that make these statement pieces for the wearers. This one has warm rich hues of yellows and rusts. I’m working on others with a more monochromatic palette along with a couple with smaller stones. Variety is the spice of life! Success is when preparation meets opportunity. I am so fortunate and grateful for the opportunities that have been coming my way. May will be the start of a very busy 2014 for me. If you would like to be the first to know of an event and/or exhibit announcements, please sign up for my newsletter. In the stillness of these past winter months, I have been working very hard and diligently in the studio. 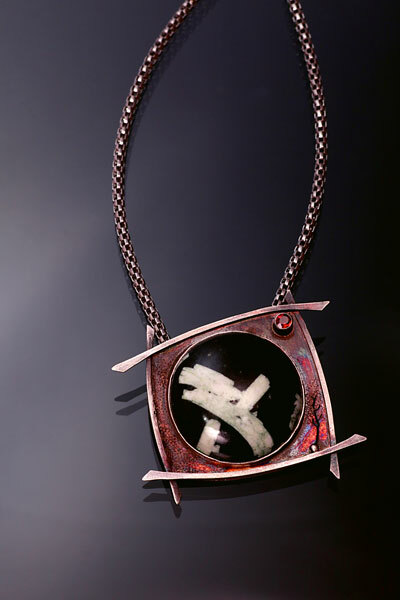 Now the new works are emerging and will be available at trunk shows, exhibits and Art Hops. 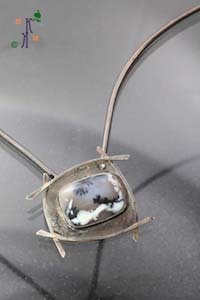 Thank you for your interest in my work and my journey in this wonderfully artistic world of metalsmithing. Just a quick reminder, this weekend is the Front Range Open Studios Tour. Saturday, 9/14 from 10 AM – 6 PM and Sunday, 9/15 from 11 AM – 5 PM. Click here for the map to all the studios on the tour. Now I want to share with you what will be happening at my studio this weekend. I also wanted to give you a sneak preview of a few of the new works I will be introducing. The Express Yourself Earrings, pictured at the top of this post have the new leaf variation in silver with a curly, vine-like stem. The stones above the pearl are Picasso Stones and are put together to resemble cairn trail markers. All of this symbolizes the true Colorado spirit I have wanted to achieve with this line. I will also be introducing a new Treescape earring with a touch of gold. The tube sets on these are 14kt gold with gemstones like Amethysts as shown in this pair. 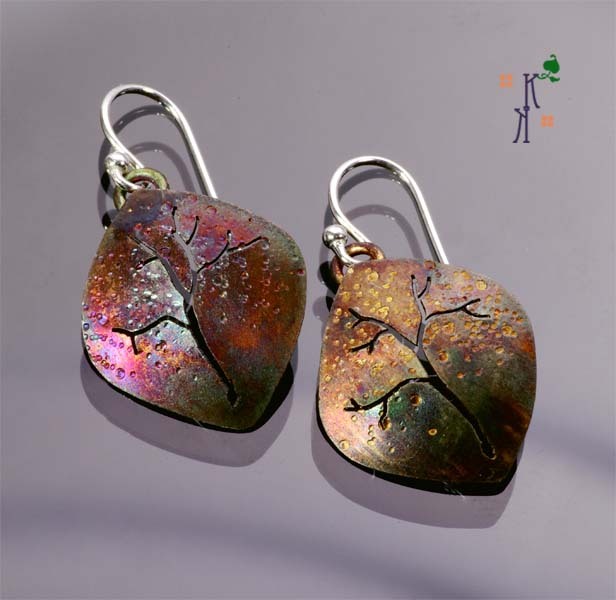 There are a number of new Treescape pendants, with colorful patinas like this one. 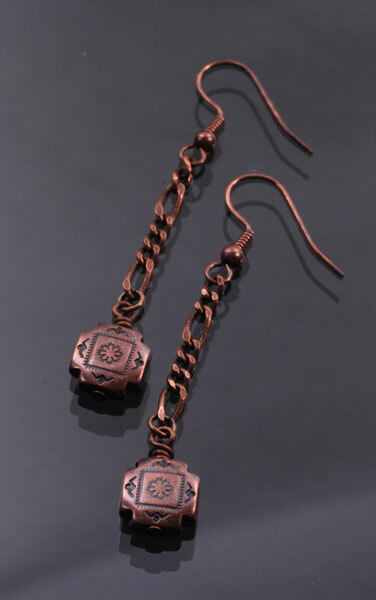 As discussed in an earlier blog post, I will be providing an opportunity for visitors to discover their inner artist by creating a pair of earrings from components I am providing. 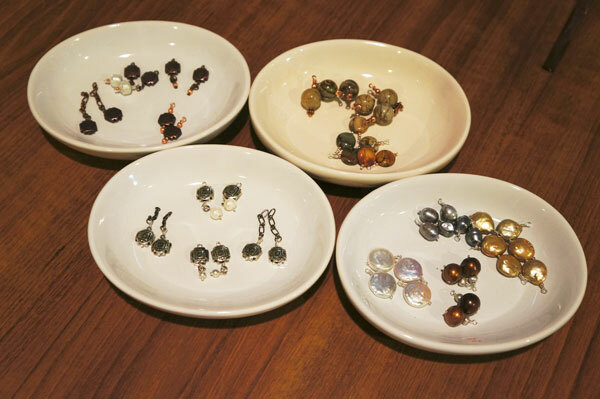 The cost of the earrings will vary depending on the components selected. Of course I will help with assembling the earrings. The added fun to all of this is a visitor can leave with earrings they created. 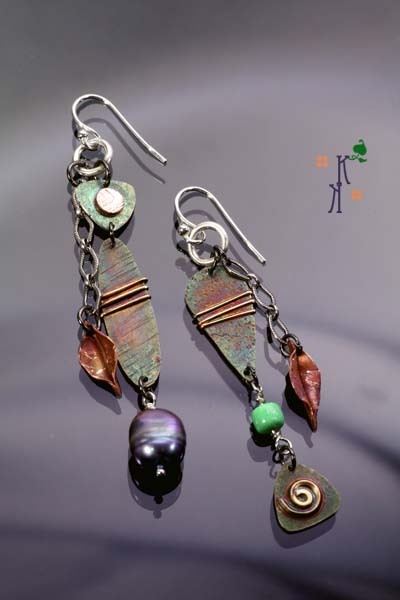 The next two sets of earrings are examples of what someone can create for themselves. 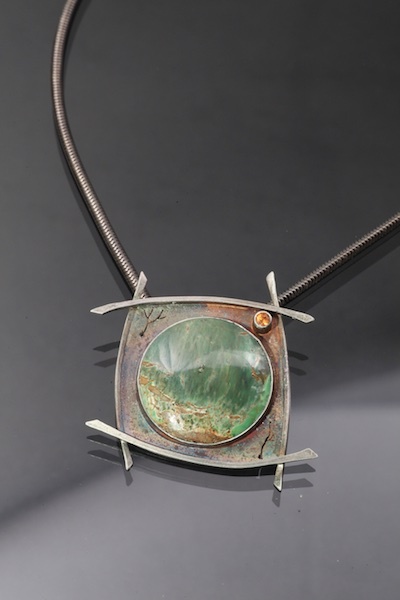 As I have done in previous years, I will be demonstrating a variety of metalsmithing techniques, discussing my creative process and showing you my studio where the real magic happens for me when I create. I hope you will visit me and the other artists on this year’s tour. with a Dash of Treescapes! Friendship. It’s a two way street. Some friends are real friends, others are just acquaintances. 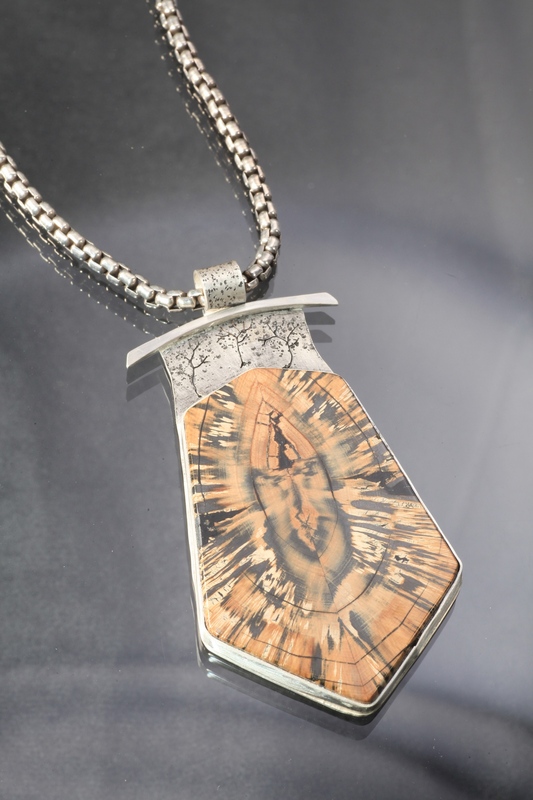 This pendant is one of the few commissions I will do, in part, because a true friend, Jerry McClure asked me if I would. Jerry and I have known each other for a number of years. He likes to call me ‘kid‘ and that just makes me smile because it is said with affection. He has been married to his wife, Sandy, for over 40 years and they embody a marriage of trust, friendship and love. He likes to tell people his just a “Dumb ole Oakie” (he’s from Oklahoma), but I can tell you nothing is further from the truth. He’s as sharp as they come, has great business savvy, and what’s most important is Jerry LOVES to help other people succeed. He has helped me and countless others. I maintain his website, Jerry McClure Knives. He is one of the most generous people I have had the pleasure to meet and call my friend. 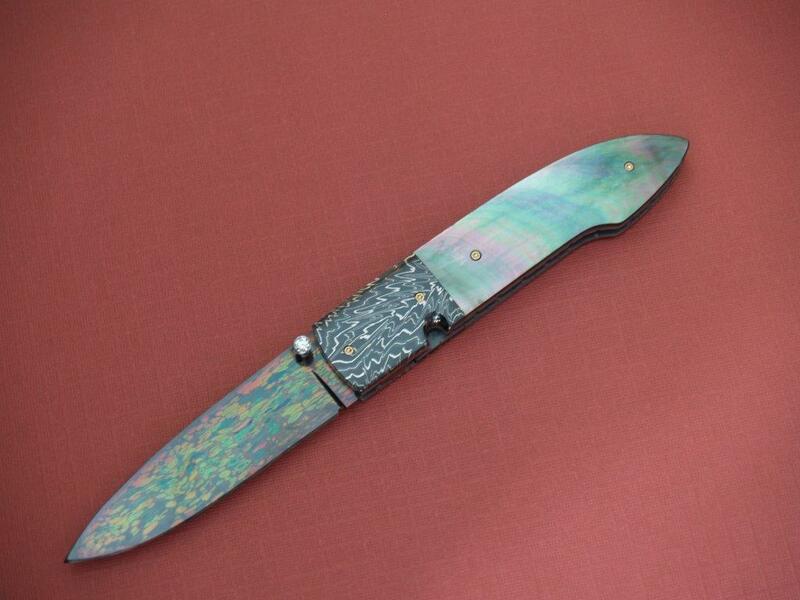 In addition to all of that, Jerry is a very talented knifemaker. He would tell you that his work is “just alright“. I get that. 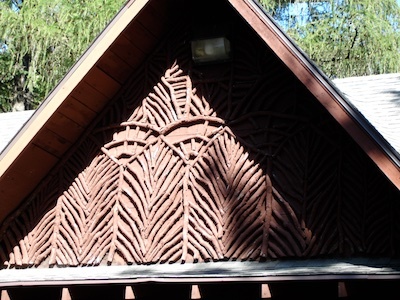 But let me show you a few examples of Jerry’s work which speak for themselves. 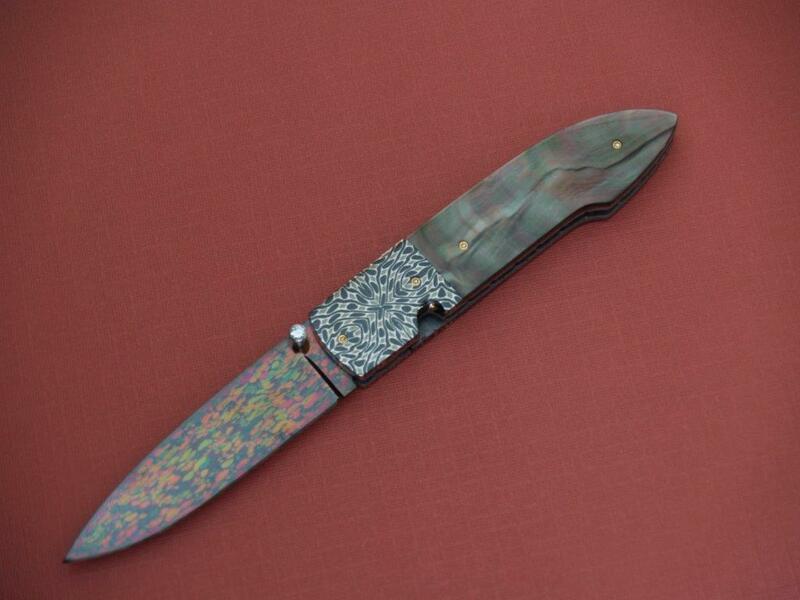 Jerry will have these knives with him at the Professional Knifemakers Show in Denver next weekend. Clearly, the proof his talent is in the work. 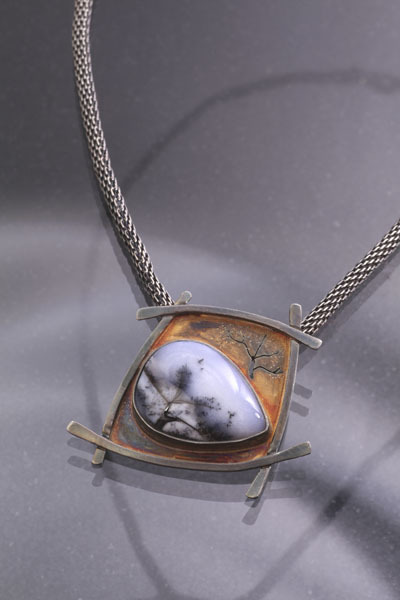 Jerry strives to get better with every piece he makes. I so admire that quality in him. And I am blown away when he tells me that he likes my work, because, you see, I strive to reach Jerry’s level of craftsmanship. If I ever do, well, let me tell you, Jerry will still be light years ahead of me. It’s not a race, it’s not a competition, it’s just two friends who respect each other and admire their respective works. What Jerry does is motivate and give me incentive to be better. So while I don’t do many commissions, due to the constraints on my time, when Jerry asks, I do my best to say “Yes!”. I don’t want to let Jerry down. Last year was the first year Dan & I went to this event. We really enjoyed it and I loved finding new materials to use in my work. We plan on going again this year. I’m really looking forward to it. I hope you can go to the show, if you do, please stop by and say Hi to Jerry……. oh yes….be sure and tell him Kathleen sent you! Until next time aspire to be more as an artist and a person. It’s been quite a summer so far. 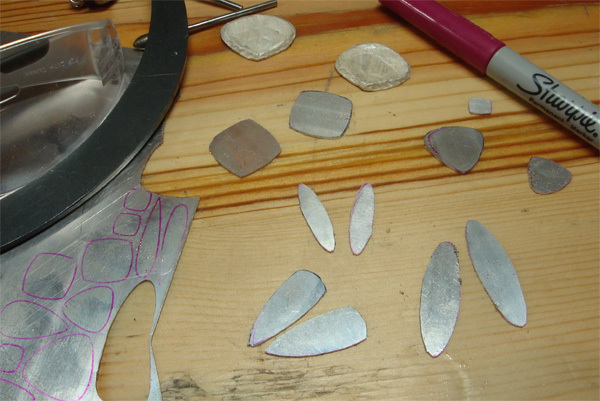 I feel like I have been noticeably absence from writing about my metalwork and I have lots to share. Day 1 – Black Forest Fire, the view to the south from our back yard. As some of you know, we were evacuated for 5 days during the Black Forest Fire in June. I wrote a bit about the experience in my other blog, if you would like to read more about that experience, click here. Thankfully, we returned to our home which was undamaged. Our beautiful girl Nocturne, with the red velvet ears. Shortly after that, our oldest Basset Hound, Nocturne, passed away. I wrote a tribute to her, with some of the pictures that told a bit of her life story. You can read the tribute by clicking here. Those two events felt like a double whammy. To be quite honest, I had no real desire to return to my studio and work. It took a while. Longer than I would have thought. Yet friends who went through the Waldo Canyon Fire a year ago said what I was feeling was quiet normal. So, I waited until things settled. Waiting for the new normal to begin. Our lives had been turned upside down. Healing of the spirit needed to occur. Thankfully, I can tell you that it has. I didn’t return to my studio until this month. My first creative stirrings began when I started to clear and declutter my bench. Prior to the evacuation, I had enjoyed a burst of creativity and the top of my bench was covered with the evidence of that flurry of activity. Clearing things felt good. The fire became a motivator to eliminate things that are not used anymore. I am in the process of selling equipment and supplies related to my fused glass work as I’m no longer working in that medium. I feel like I need a fresh start; a complete rework and reordering of what is necessary. Once I returned to the studio, I started to work on completing a number of projects I had started. 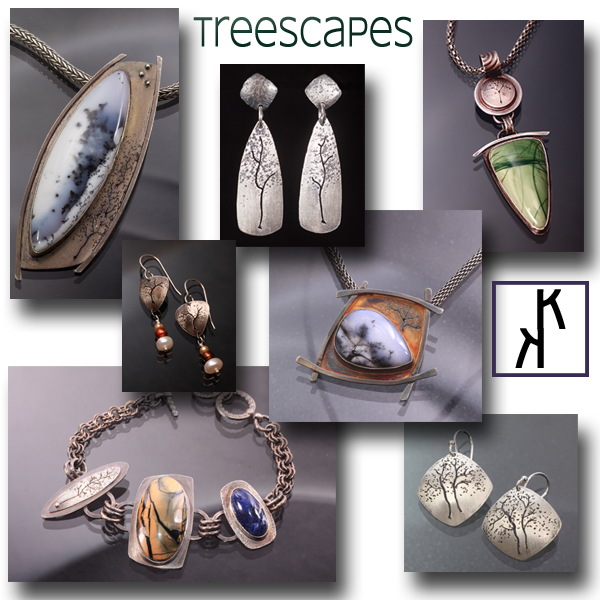 Those include items in my current Treescapes and Express Yourself series. I thought I would share a few of the completed pieces, along with other news. 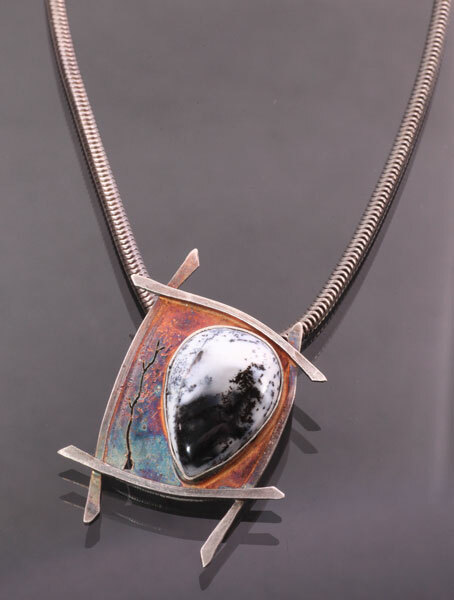 This summer I’ve been participating in Monument’s Art Hop at Santa Fe Trail Jewelry in Monument, CO. Art Hop in Monument takes place on the third Thursday of the month. Those have been wonderful experiences for me. I get to spend time with my friends Marylee Reisig (who owns Santa Fe Trail Jewelry) and Nancy Bonig (Glass Artist extraordinaire!). These art events have given me a chance to talk with so many people about my work. I’m very grateful for all of the new connections. In September, I will be part of the Front Range Open Studios tour again. It’s the third year for the tour and each year just gets better. My friend Nancy Bonig does such a terrific job promoting the artists and the tour. It continues to grow thanks to her efforts. More details to come….. in the meantime, if you go to the tour facebook page and ‘Like’ them, you will get details on surprises the artists have in store for this year. This year I plan to do something a bit different on the tour. 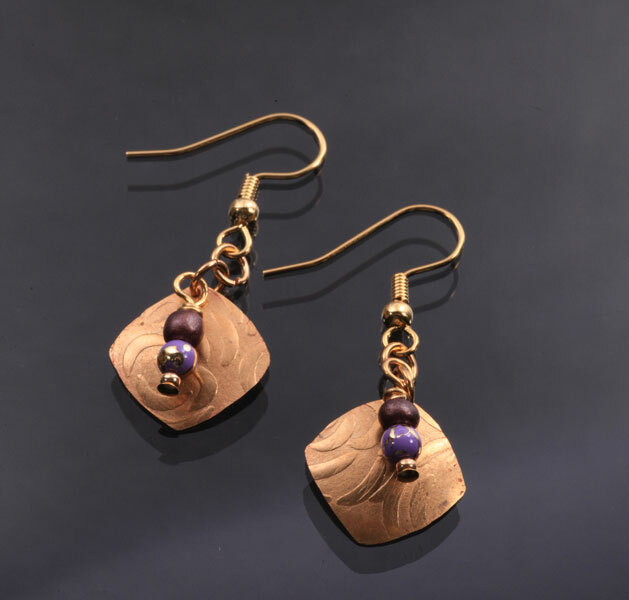 In addition to demonstrating some of my metalsmithing techniques, I thought it would be fun to let people pick and choose components for making their own earrings. 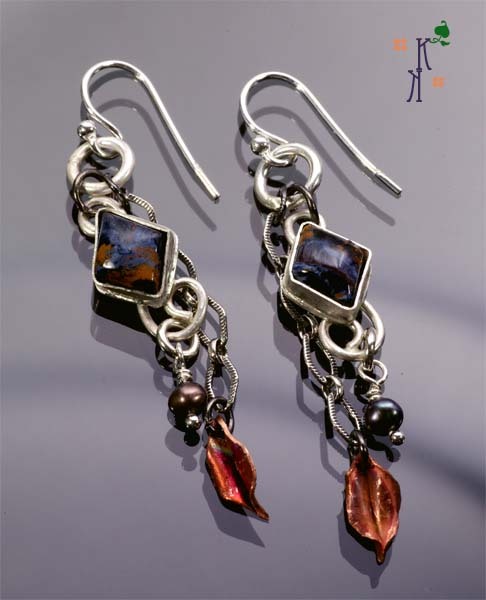 I will help them put things together and they get to leave with a pair of earrings of their very own design. How many of you would find that fun to do? I often post updates about my progress, new works and ideas on my Facebook fan page, so if you haven’t ‘Liked’ my page, I would encourage you do do so. 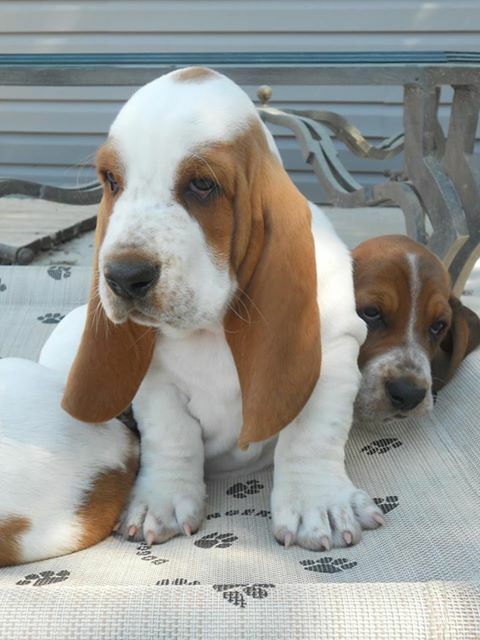 And now, I am happy to share the best news I have had throughout this very eventful summer….this beautiful basset puppy with be joining our family after Labor Day. This is Thorin, named after one of our favorite dwarfs in The Hobbit. We have been told that he has quite the personality. He’s a character, is the only boy in the litter so he believes he is very special (and I can tell you we already think he is extremely special). Some fun facts, coincidences about him…..he was born on June 10, the same date that our beloved Bueller was born 13 years ago. And he has a beautiful red dot on the top of his head, just like our sweet Little Miss Nocturne. Synchrodestiny (the ebb and flow of the universe coming together)? I think so. Dan & I also think he has Bueller and Nocturne’s blessing. Nothing warms my heart as much as a basset hound…except for Dan of course…… and Thor will soon take up the role as junior studio mascot with my crew of Newton and Quorra. I can hardly wait to hold this guy and welcome him into our lives. Quorra (left) and Newton in one of their many playful moments. Wait til they meet Thor! So it has been quite a summer. Life’s ups and downs. The unexpected. Lessons learned. Joys and sorrows. That is what life is all about and I can tell you that Dan & I feel so blessed. We are grateful and looking forward to what the future holds. Until next time, aspire to be more as a person and a artist. I am happy to announce I will be having a Trunk Show this Saturday, June 8, 2013 from 12:00 PM to 5:00 PM. Christine Pech, owner of Colorado Expressions will be hosting this show. Christine and her daughter have created a wonderful gallery space located in downtown Colorado Springs. They even have a baby grand piano that patrons can play! I will have lots of new Express Yourself earrings, including the ones pictured here. There are a few new Treescapes that will accompany me for this show. 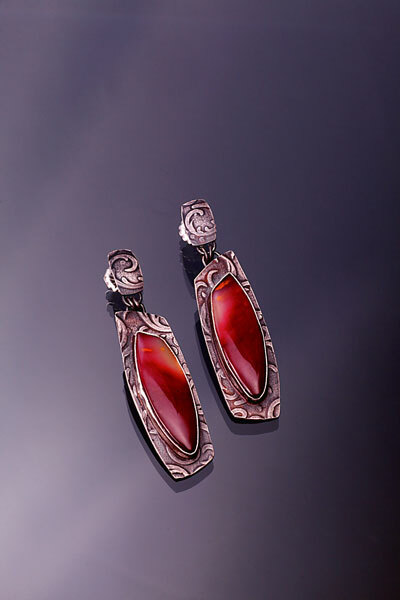 I’ve been experimenting with patinas and here’s a sneak preview of one of my more colorful pairs. There are so many beautiful things at Colorado Expressions. If you are in the area, I hope you can stop by, say Hi and spend some time with me and Christine talking about art.